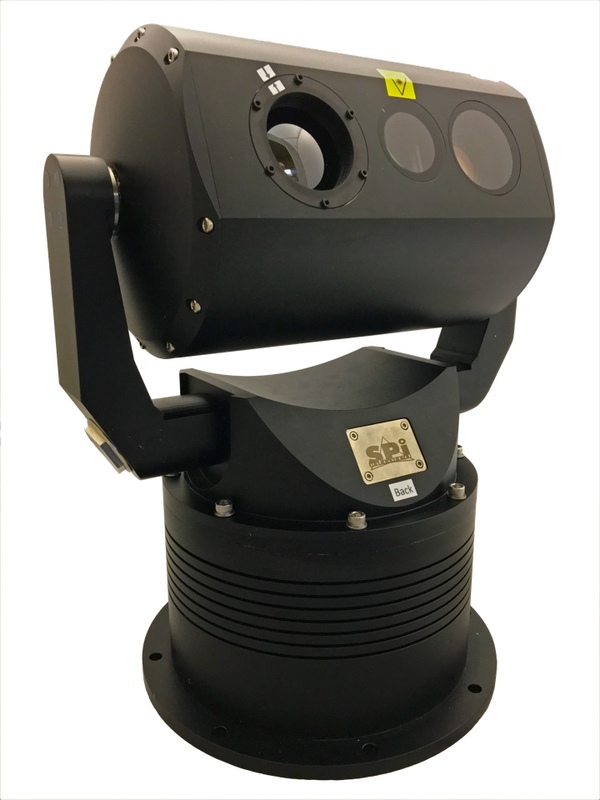 The new SPI multi sensor pan tilt FLIR unit M11 is an ultra long range state-of-the-art high grade multi sensor pan tilt zoom unit that is built with the highest performing products and sensors available. 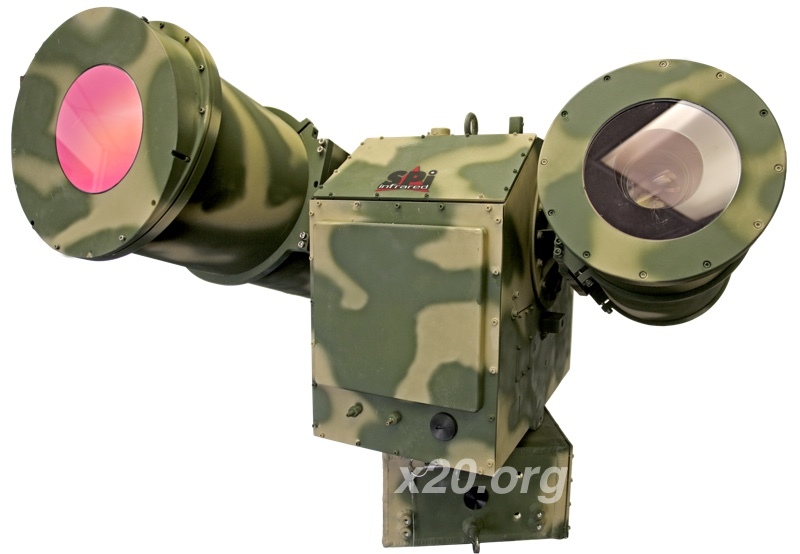 The rugged pan tilt unit is a weapon grade pan tilt gyro stabilized gimbal turret, the multi sensors include long range cooled InSb Mwir FPA thermal imaging Flir detector with extreme long range CZ continuous zoom auto focus lens from 25mm – 1550mm, the daytime visible HD camera is comprised of the lowest light gathering ultra sensitive CMOS sensors with zoom lenses exceeding 3000mm. The unit has add in lrf laser range finders, ir infrared lasers, GPS, compass, and SWIR, NIR and LWIR options. The M11 multi sensor pan tilt FLIR camera is suited for force protection, border surveillance and various security tasks. Protecting troops is essential for success on the battlefield and protecting a country’s borders is vital to its national security. It is however very challenging to detect enemy soldiers and potential intruders or smugglers in total darkness, in the most diverse weather conditions. The M11 PTZ Multi Sensor Unit will help to meet the demands faced at night and in other low-light situations, ports and airports, nuclear plants, petrochemical installations, are vulnerable to theft, or even worse terrorist attacks, and can be well protected by the M11, FLIR PTZ pan tilt Thermal imaging cameras expose threats hidden in the darkness, concealed by ill adverse weather, and veiled by obscurants like dust, fog, and smoke. 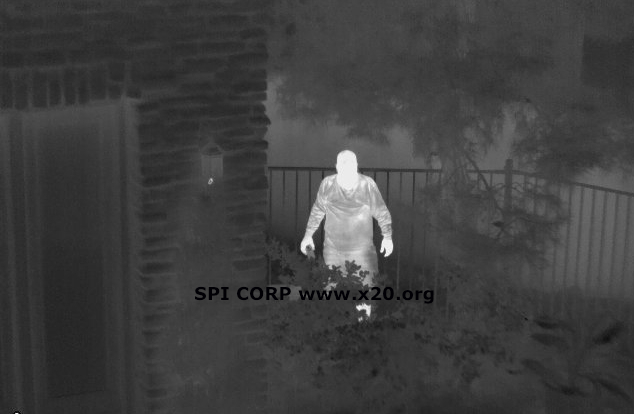 SPI’s thermal imaging cameras detect intruders sooner, provide more time to react and protect people, assets, and infrastructures. They are operational 24 hours a day even in the darkest of nights, fog, snow and smoke. Because everything generates heat, thermal IR imaging night vision MWIR / LWIR FPA cameras can see as well at night as they can during the day. Cameras dependent on visible light are useless at night or in poor visibility without supplementary illumination from lamps, LEDs or lasers. The extreme long range M11 Pan Tilt FLIR Multi Sensor Thermal imaging camera will not only protect borders and assets against intruders during the darkest of nights. The SPI high gain cameras are also perfectly suited for daytime surveillance. The M11 MWIR Cooled Long Range FLIR Pan Tilt thermal imaging camera will detect objects that remain invisible to the naked eye. Like, people hiding in the shadows or in the bushes will be detected. The cameras are also not blinded by glare from the sun. The long range M11 PTZ IR Infrared thermal imaging surveillance system will cover more territory and enable detection and classification better than any other sensor suite available. Networkable video and command/control make the M11 Pan Tilt FLIR Multi Sensor thermal imaging / EOIR unit the perfect border security imaging solution. The system can be connected to a radar in a so called slew to cue configuration. If the radar detects an object, the camera turns in the correct direction so that you get a visual image from that blip on your radar imaging screen. The M11 Pan Tilt PTZ MultiSensor systems integrate long range, zoom, mid-wave High Definition HD FPA thermal imaging MWIR INSB camera with a variety of powerful daylight BSI CMOS HD sensors, Video Tracking, detecting and alerting is available to compliment the system. Optional LRF Laser Range Finder, GPS, SWIR, NIR, Color night vision, Explosive, chemical and gas detection sensors are available with Digital Magnetic Compass (DMC). An array of advanced functions and options are available to meet the most demanding needs. All sensors on the Long Range Border M11 EOIR Pan Tilt System are mounted on a fast and accurate rugged, all-weather, waterproof Pan & Tilt FLIR unit. Protecting coastlines from intruders is a growing concern for nations around the world. Each country has its own unique set of problems – illegal immigration, asylum seekers, smugglers, terrorists or pirates. However, they all have a common attribute of the intruder having to approach a coastline by boat. Some slowly and covertly, while others may chose to reach the shore as quickly as possible. Nevertheless, detecting that intruder day or night and under all weather conditions is the goal of most governments and security organizations concerned with coastal and harbor security. SPI’s Comprehensive advanced long range PTZ EOIR/RADAR Imaging system is optimized to detect and locate these coastal intruders either in small, slow boats or in fast motor boats and under almost all weather conditions. The SPI Comprehensive advanced long range PTZ EOIR/RADAR Imaging system includes unique algorithms for differentiating the boats from waves and detecting very slow or static objects on the water surface. The SPI Comprehensive advanced long range PTZ EOIR/RADAR Imaging system compact size, just 0.6m wide and low power consumption allows it to be deployed on existing infrastructure or on temporary or mobile platforms. Integrated with Thermal Imaging FLIR cameras and other tracking systems, The platform can detect, locate and then allow the operator using cameras or other sensors to identify the intruder from other legal water users such as fishermen, water taxis, and pleasure boats. The SPI Comprehensive advanced long range PTZ EOIR/RADAR Imaging systems PESA (Passive Electronic Scanning Array), Doppler and FMCW (Frequency Modulated Continuous Wave) technology offers zero maintenance, ultra high reliability, low power consumption, covertness and an ability to detect and locate small covert boats in the complex coastline region. Additionally it can provide conventional long range boat and ship tracking functions integrated with AIS (Automatic Identification System) and the SPI Imagers Small Boat Tracking system. The principal challenge for any coastal surveillance system is detecting small and slow moving boats in poor weather conditions including rough seas and rain. In many parts of the world, local fishing boats – Pangas and Dories are used as the preferred method of moving people and equipment between shorelines. The traditional fishing boats are generally compact in size, low lying in the water and have very little structure above the water, many being made of wood. These boats present a very small target size to radars and camera systems. Also it is not uncommon for a boat to be so heavily loaded with people that it lies mostly submerged in the water. In some regions, where an individual person is involved, such as an asylum seeker or smuggler, it is possible for that person to swim ashore, possibly from a nearby island or perhaps a neighboring country. Generally any person taking this type of action will have planned their action and therefore it is most likely that they will carry with them a bag in which to hold dry clothes or smuggled goods. Such an intruder can also be detected by security radar systems like SPI’s Advanced Ultra Long range Combo Radar/Thermal Pan Tilt Zoom PTZ . Weather is the biggest challenge for intruder detection systems. Waves in particular are dynamically changing in position, size and appearance. Without careful sensor design waves can hide or obscure the intruder from detection by radar and cameras. Rain also serves to reduce the effectiveness of sensor systems. In the case of camera systems, rain simply blocks the visible image of the intruder, but for radar, without careful design, the rain not only attenuates the radar signal but also creates false targets due to the reflectivity and motion of the pockets of rain. 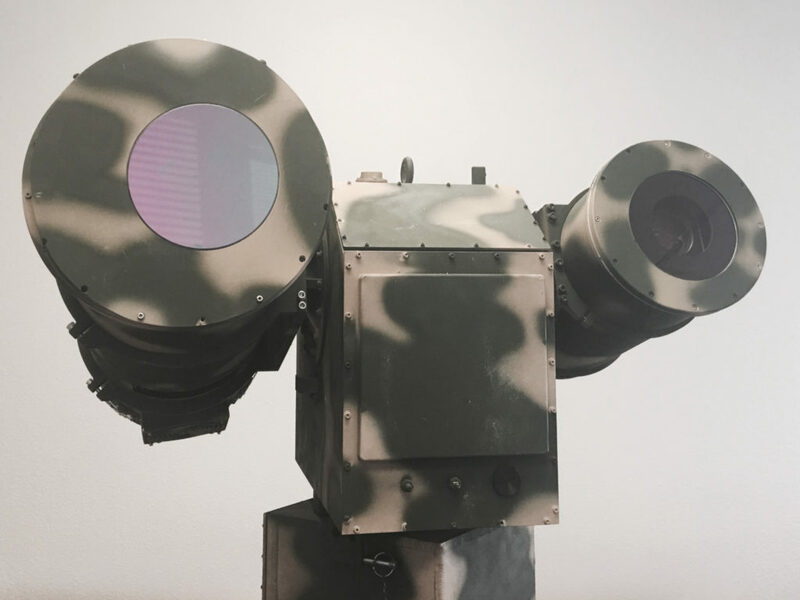 Fog is the third major challenge for some coastal sensor systems and in particular camera systems, though thermal FLIR MWIR and LWIR imagers and some high-end laser range gated camera systems do now offer a fog-busting capability. However, the small water droplet size in fog makes it almost insignificant to radar systems. It is worth noting that many intruders, wise to sensor limitations in poor environmental conditions, choose to exploit bad weather to evade detection. In some parts of the world, immigrants and smugglers only become active during heavy rains or high sea states. The sensors therefore need to operate at the very time when most are compromised by the complexity of the environment. The final challenge for many remote surveillance systems is the task of finding a suitable location on which to site the surveillance platform, typically consisting of an equipment cabin, mast, sensors and then some source of power and remote communications. The remoteness of many ideal surveillance sites makes the challenge of installing traditional larger and power hungry systems near impossible. It is just not possible to build concrete bases for masts or supply mains power. Compact, lightweight, low power systems have a light footprint for installation potentially being tripod mounted and operated from solar or wind power. Satellite communications (SatCom) is an available option for almost all sites, but is expensive and has a number of major technical disadvantages including poor latency (communication delay) and marginal operation in heavy rains. Alternatively, sensor systems that require only low bandwidth communication can make use of lower cost and more effective direct radio links including microwave communications links. SPi Is now offering the X27 color low light night vision sensor onto the M9 / M11 EOIR Payloads, the X27 color night vision system has incredible low light color capabilities and easily detects military IR lasers up to 1220 Nm. The SPI Advanced Pan Tilt FLIR coastal and border defense imaging systems are a powerful security device when used on its own allowing day and night surveillance of huge areas of water and warning the operator of anything that is a potential threat. However, the capability of M9/M11 is multiplied by the inclusion of other sensor information including cameras, as described above, and also other situational awareness sensors. The majority of remote sensors are coordinate based and so one of SPI’s components is its mapping system, The SPI Software enhancement package is able to control most long-range ‘camera’ systems. Typical camera systems for surveillance comprise of multi sensor, Multispectral systems containing daylight, and possibly low-light, color camera, color night vision, HD cmos continuous zoom optics, a thermal FLIR (MWIR/LWIR) Imager, cooled for long range or uncooled for shorter range low cost applications, and possibly a combination of other complementary sensors including a wide field of view ‘Context’ camera allowing the operator to assess where in the large picture he is looking. Laser range finders (LRF) are often integrated with camera systems, and serve to confirm the range of the target being detected on the radar. Some high end camera systems include range-gated laser illuminated systems that can illuminate a specific range segment, allowing it to look through precipitation. Here the range provided by the SPI radar allows it to precisely set the range gate, field of view and focus of the laser gated camera. Over water, AIS is typically used to provide information about cooperative boats and ships fitted with AIS transponders. Such information includes position, heading, speed and often other characteristics of the boat. This can be displayed on SPI Radar/FLIR thermal imager to overlay on the radar display. However the use of AIS with a coastal security radar is limited as the targets have willingly fitted AIS. Most usefully, AIS allows radar targets associated with the AIS information to be ignored as they are not a threat. In some coastal installations there can be huge numbers of legal boat users including fishermen, water taxis, pleasure boats and even jet skis. The M9/M11 Surveillance Systems has a ‘Small Boat Tracking’ (SBT) system that allows, at low cost, a simple battery RF transponder to be fitted to these small boats as part of a managed authorization scheme. The SBT system allows basic ID and position data to be transmitted back to the Radar/FLIR thermal imager allowing all authorized traffic to be monitored. With all large boats and ships fitted with AIS and all legal small boats fitted with the SBT system, the System can then identify the unknown, unauthorized boat approaching the shore. SPI MidWave MWIR, Short Wave SWIR and Long Wave LWIR Surveillance Systems also offer land vehicle based tracking systems allowing the Radar/FLIR thermal imager Coastal and Harbor Security PPS document operator to view not only the water but also where security forces on land are located. For coastal installation, especially where port or harbor security forms an integral part of the system, Radar/FLIR thermal imager is able to integrate PIDS (Perimeter Intruder Detection Systems) into its display. Typical PIDS systems include fence and ground based fibre detection systems, microwave barriers, PIR, detectors and other Unattended Ground Sensors (UGS) including seismic, proximity, PIR (Passive Infra-Red) and simple trip wires. The SPI Radar/FLIR thermal imager is able to display all types of PIDS either as a single point on the display or a line of sensors for linear array type sensors.SPI Radar/FLIR thermal imagers can simply add layers of sensor information into its framework allowing it to be expanded to accommodate new sensors types now and in the future. Displaying many sensor types can create a confusing display, especially if each sensor has an inherent false alarm rate. If required multiple geo-sensors may be integrated into a sensor fusion system (Image/sensor channel blending/stitching) allowing alerts from multiple sensors on the same target to be displayed as a single unified alert. This reduces operator workload, simplifies the display and can be used to reduce false alarms if multiple alert filtering rules are applied. Ideally multi-target fusing would allow targets to be validated and their positional accuracy to be improved beyond the accuracy of any one sensor. However, consideration must be made for the diverse nature of different detection systems as the timeliness of a detection warning and the measurement accuracy and resolution of each sensor can give rise to incorrect target association in the fusing application. For example, multiple targets detected on one sensor may be correlated with just a single target on another lower resolution sensor, and low-latency radar target outputs may not accurately correlate with the position of tracking systems that use Sat Com, GSM or other high-latency communication systems. For this reason, SPI Image/Sensor Fusion can be very beneficial to simplify presentation of targets and reducing operator workload, but consideration should be given to the risk of hiding valuable ‘raw’ unfiltered sensor information. SPI Radar/FLIR thermal imager can usefully enable or disable the display of all layers of information so for long range surveillance where accuracy is not essential, the fused sensor information only can be displayed. At shorter ranges or in critical areas, all raw sensor information can be displayed allowing detection and interception of intruders at the earliest opportunity. For the latter situation a higher skilled operator would be required. BORDER SURVEILLANCE SUMMARY The Department of Homeland Security (DHS) is implementing several initiatives toward securing the border, including the Secure Border Initiative (SBI) and the Western Hemisphere Travel Initiative (WHTI). SBI takes a systematic approach to border security by integrating and unifying border security systems, and developing and coordinating programs and policies to secure the border and efficiently enforce customs and immigration laws. The goal of WHTI is to strengthen border security and facilitate entry into the United States for U.S. citizens and legitimate foreign visitors. BORDER SURVEILLANCE PLATFORMS Securing national borders has become increasingly difficult. Global deployments call for a wide range of mission capabilities requiring flexible, high-performance multi-sensor systems, installed and operated from a variety of platforms. The most effective intrusion detection systems use multiple technologies to increase the probability of early detection with low false alarm rates under a range of atmospheric and lighting conditions. Closed circuit television (CCTV), infrared imaging cameras (consisting of cooled midwave MWIR 3-5 Um Microns, uncooled longwave LWIR 7-14 Um Microns with an assortment of short medium long and ultra long range optics/lenses, surveillance UAVs, long range radar and laser radar (LIDAR) are often deployed in appropriate combinations. Short- and medium-range platforms integrate a wide variety of sensors – including such systems as taut-wire perimeter detection, vibration intrusion detection, electromagnetic intrusion detection, electrostatic field disturbance, electro-optical observation, and even microwave field disturbance detectors. • Perimeter fences – deploy a variety of electronic surveillance technologies for intrusion detection and warning. These ground-based systems are primarily short-range, up to around 500 meters. • Observation towers extend surveillance capabilities many tens of kilometers further from a border installation, and provide a platform for ground-based medium-range surveillance. • Mobile surface observation platforms, such as land vehicles as well as maritime vessels, patrol frontier regions and coastal waters, extending the reach of medium-range surveillance sensors. • Observation aerostats, stationary platforms, generally tethered balloons, allow for extended observation over wider areas, extending the reach of surveillance sensors beyond what can be seen from an observation tower. Thermal imaging is useful in broad daylight. A thermal imaging camera cannot be blinded by the sun like a normal CCTV camera. Furthermore, thermal contrast is extremely difficult to mask so people trying to camouflage themselves or trying to hide in bushes or shadows will seamlessly be detected. Both LWIR uncooled and MWIR cooled Thermal imaging PTZ FLIR technology detects changes in temperature. Based on subtle differences in temperature, called heat signatures, thermal imaging cameras create a crisp image. Thermal imaging needs no light whatsoever to produce a clear image, in practically all weather conditions, on which the smallest of objects can be seen. Due to their ability to detect man sized targets at extremely long distances, thermal imaging cameras are extremely suited for border surveillance. Pan and Tilt Thermal imaging cameras with cooled detectors for border security There exist two different types of thermal imaging cameras: those with uncooled detectors and those with cooled detectors. 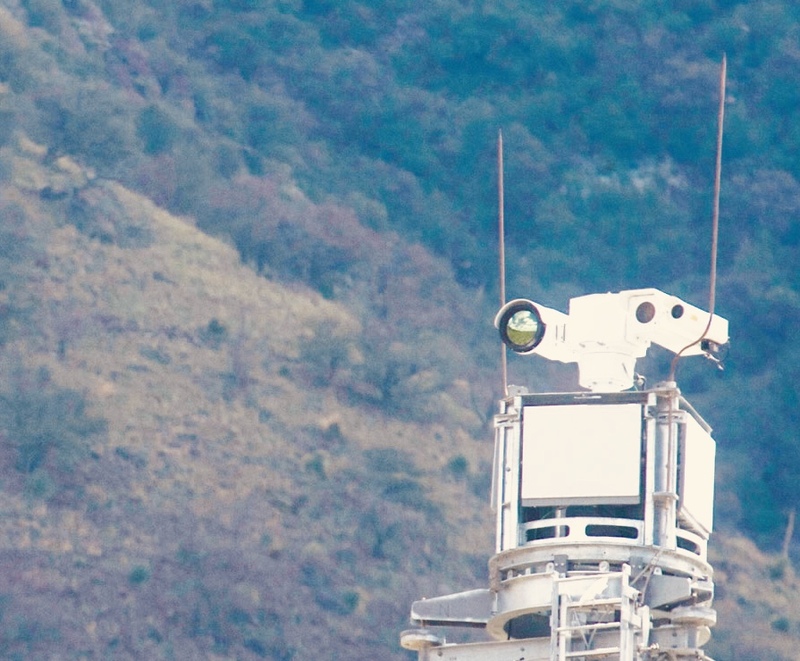 Generally, cooled cameras are used in border security applications as they provide a longer range performance than versions with an uncooled detector. Some models with a cooled detector are able to detect a man-sized target at a distance of 25km+. Thermal imaging systems are often used in conjunction with daylight/lowlight cameras that can be used when conditions permit. Installed on a pan/ tilt with zoom (PTZ), these so-called Multi-Sensor Systems can easily be integrated with radar systems in a so-called “slew to-cue” configuration. If an object is spotted by radar the Pan Tilt zoom thermal imaging camera will automatically turn in the right direction so that it can be seen what the blip on the radar screen really means. Many MultiSensor / MultiSpectral PTZ Systems are mounted in this “slew-to-cue” configuration. Multi-Sensor configurations can also be equipped with GPS and a digital magnetic compass to ensure the operator knows where the thermal imager is (this is important for border security applications where the camera is installed on a vehicle) and what direction it is pointing in. Some systems also have a laser range finder to provide a measure of how far away an object is. A tracker can optionally be installed as well.